I think of that question at the end of every day. I remind myself that God has given me the gift of 86,400 seconds that day. Once I’ve spent that portion of my life, it’s gone. What did I get in return? Did I spend those seconds wisely? Third, make time and space to write even if you don’t have the time or space. There’s no “later.” There’s no “when I get around to it.” There’s no “when I have more time.” There’s only now. If you don’t write now, as busy as you are, you won’t ever write. Writers don’t “get time” to write or “find time” to write. They make time to write. Every writer needs a creative space. It doesn’t need to be a plush office overlooking the seashore. In fact, you’re better off without such distractions. As a writer, your job is not to look out the window, but to look within. A desk, a chair, a computer, and you’re set. Your creative space does not have to be in your home. I have a successful writer friend who writes his novels in a coffee shop. But that’s not for me. I do most of my writing by speaking into a microphone attached to my computer. I don’t like people overhearing me while I write, so I work at home, in my modest-yet-comfortable office, with the doors closed. Works for me. Do whatever works for you. 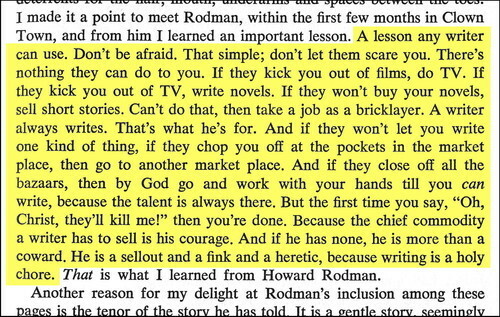 No one’s standing over you to make you write. Your motivation must come entirely from within. You’ve got to want to write more than you want all the things that keep you from writing. If you procrastinate, you’ll have nothing to show for all your years on earth but a list of excuses. Life is made up of choices, and every choice we make has consequences. Make the right choices, and you can have a successful and enjoyable writing career. But you have to be deliberate in the choices you make. If you don’t make careful, thoughtful choices about how you spend your time, other people will make those choices for you. To have a successful and rewarding writing career, you must spend your life pursuing your own goals, not doing what other people expect of you. Fifth, beware of “displacement activities.” A displacement activity is behavior that takes the place of writing. We engage in displacement activity when we feel anxious and conflicted — for example, when we want to write at the same time we feel we can’t write because we are blocked or we simply lack the energy to write. The state of wanting to write while feeling unable to write is unresolvable — so we displace our anxiety through a different activity. Instead of writing, we raid the fridge, surf the Internet, update our Facebook status, tidy up the desk, answer emails, play computer games, and on and on. If our displacement activity is more-or-less writing-related (such as “research”), our anxiety level goes down. We know we’re not writing, but hey, it’s kinda like writing, so we don’t feel so bad about it. Some writers, unfortunately, use drinking or drug abuse as their displacement activity. Writers who medicate their anxiety with mind-altering substances usually end up wasting their talent. If you are aware of the things you do to displace your anxiety, you’ll be empowered to control your displacement behavior. Instead of compulsive eating or web surfing, get up, move and stretch, and grab a cup of tea or coffee. Give your Muse a chance to catch her breath — then get right back to your writing. To make the most of your writing time, discover the power of writing in overdrive. Learn to write freely, quickly, and without inhibition, tapping into that incredibly powerful source of inspiration, the Muse or unconscious mind. The year 2014 was one of the most difficult years of my writing career. That was the year we moved for the first time in more than twenty years. The sale of the house and the moving process occupied at least eight weeks of my life. Also that year, my father — a good and great man who was always a hero to me — died unexpectedly. So it was an emotionally wrenching year as well. I had a number of books lined up for several different publishers, plus an assortment of short-term projects. After the move in March and the death of my father in May, I found myself falling behind on deadlines. After I delivered one book late, every other book on my schedule became a race against time. I wasn’t used to being so far behind schedule. I wasn’t used to asking editors for deadline extensions. I wrote quickly and worked productively, producing more than half a million words for publication that year, averaging almost 1,500 words per day — and those averages included the two months during the house sale and move, when I got almost no writing done at all. How did I get so much writing done during that year of adversity? I adopted a schedule that was insane and almost suicidal. I don’t recommend it. In fact, I offer this account not as a brag, but as a confession. I think I scheduled my writing year very stupidly, and I have vowed never to do that to myself again. More on that in a moment. You cannot buy time. You cannot save time. You cannot stretch time. You cannot make up for lost time. You must use each moment to the fullest; there’s no guarantee you will ever have another. Whatever you want to accomplish, do it now. Wise King Solomon offers this insight into the true nature of time: “To every thing there is a season, and a time to every purpose under the heaven: a time to be born, and a time to die; a time to plant, and a time to pluck up that which is planted” (Ecclesiastes 3:1-2 KJV). This is your season. Writing is your purpose. Now is your time. Second, commit yourself to living a balanced life. I paid a heavy price to re-learn this lesson. During 2014, I stacked my writing projects and deadlines too close together, and I didn’t leave enough cushion in my schedule to allow for the unexpected. And it turned out to be a year of unexpected events. There was a period of about six months when I averaged four or five hours of sleep per night, seven days a week. It was a nightmarish existence, in which I sometimes found myself dreaming (perhaps even hallucinating) at my computer. I found it hard to stay awake during the day, hard to get to sleep at night. I soon realized that my overtaxed brain was acclimating itself to this ungodly schedule, because I was regularly waking up a minute or two before my alarm went off, after only four hours of sleep. I consumed the elixir of more than a pound of coffee beans per week. My judgment suffered. My friendships suffered. I was so immersed in sleeplessness and stress that, following the death of my father, I delayed the full onset of the grieving process. When my deadline stress finally subsided in the summer of 2015, grief over my father’s death began to hit me harder than ever, more than a year after his death. Throughout 2014, I produced a lot of words, a lot of books, but I mistreated my brain and neglected my family. That’s no way to live. And that’s no way to write. So, from now on, I’m committed to living a balanced life. Clearly, I have accumulated regrets from that difficult year. But here’s something I don’t regret: No matter how many mistakes and poor choices I made in 2014 (and they were legion), I made sure I left nothing unsaid, no unfinished business with my family. I made sure I said “I love you” to the people I love. The night before my father died, I called my Mom and Dad on the phone and we talked for about forty minutes. My dad had no major health problems, and I had no reason to suspect that this would be my last conversation with him. We laughed and shared memories. It was a good talk, as so many of our talks have been. At the end of that conversation, I said, “I love you both.” And they said, “We love you, son.” That wasn’t unusual. We often said those words to each other. This life is all too short, and time is a nonrenewable resource. Invest each day wisely. 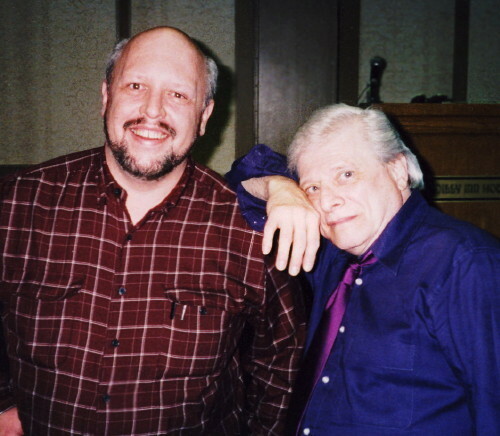 I was recently rereading Dangerous Visions, the ground-breaking science fiction story collection Harlan edited. I first read the book in 1967, when I was fourteen. The book came out just months after one of Harlan’s most powerful stories appeared on newsstands in the March 1967 issue of Worlds of IF. That story was called “I Have No Mouth and I Must Scream,” and it detonated in my brain like a nuclear warhead (and that’s a good thing). If you write, heed those words. Whatever the obstacles in your path, keep writing. A writer always writes. That’s what you and I are here for—to write fearlessly. That’s our holy chore. Here’s to all your dangerous visions!